approaching "ATMOSPHERE" complex and another skyscraper – under construction. Viewed from the East Metropolitan Bypass. Design team: Web Structures, architects Peng Beng and Belinda Huang of Arc Studio, Singapore. "Atmosphere, a new architectural icon in India, is a Rs. 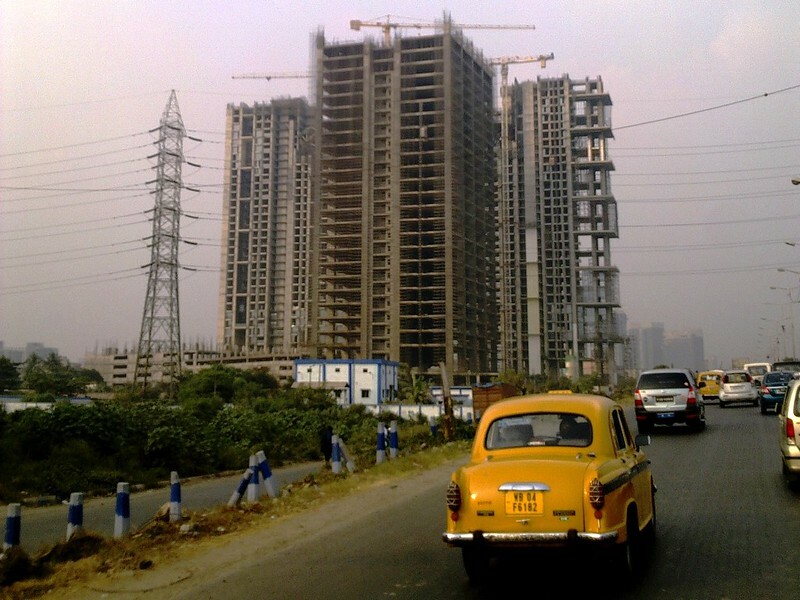 800 crore luxury residential condominium project consisting of two tall towers which will currently be the tallest in Kolkata. 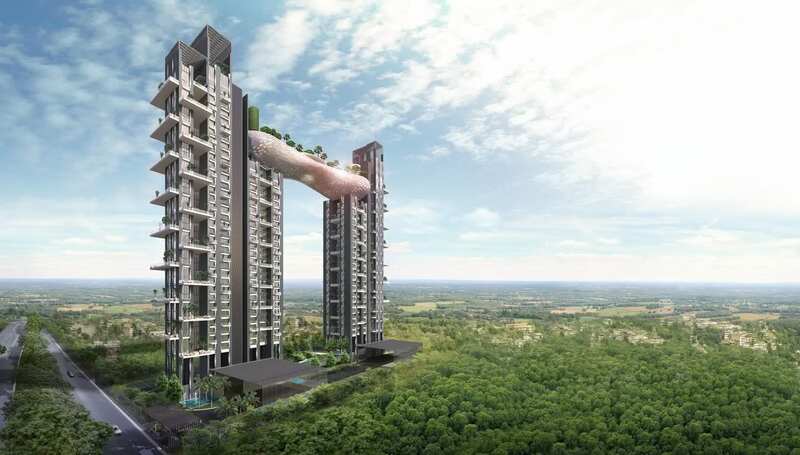 The towers will feature villas in the sky with large private terraces and gardens for each unit. Connecting the two towers and sitting 100 metres high will be the Deya. Deya which means cloud in Bengali has been designed like a floating sculpture in the sky. Inspired from Rabindranath Tagore’s poetry, the architect couple Peng Beng and Belinda of Arc Studio, Singapore has designed this 2500 ton dynamic steel sculpture. It will have a width of 100 metres. With four levels, the highest being the party deck, it will serve as a community space, and both its interior and outer skin will be put to use." “It will command a 360-degree view of the wetlands stretching before it and will feature multiple swimming pools, a gym, spas, a squash court, a basketball court, a putting green, simulation golf, games rooms, a jogging track, a mini cinema hall, a banquet hall, a state-of-the-art boardroom facilities, an open-air party deck, an amphitheater, and multiple lounges and spaces for smaller gatherings. whilst it is obvious from what i’ve seen that there is another tower under construction just next to it. Image published by juggadery on 2016-02-23 21:22:37 and used under Creative Commons license.